YOU GUYS! THESE DONUTS! 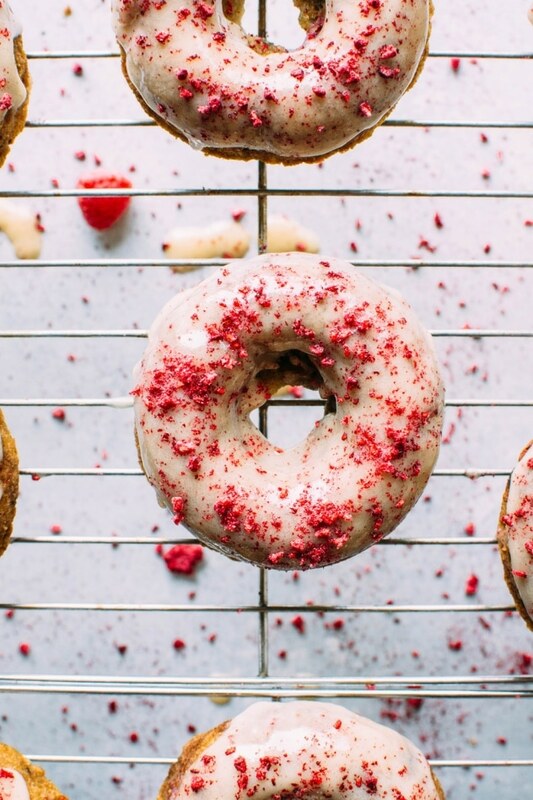 Crumbly in all the right ways, slightly springy in texture, studded with fresh raspberries, dipped in a luscious vanilla coconut glaze and sprinkled with tart dried raspberries because donuts like to look pretty, too! I’m super excited to be bringing you this scrumptious recipe in collaboration with Windy City Organics and Dastony, a company that makes raw and stone ground nut and seed butters with 100% organic ingredients. 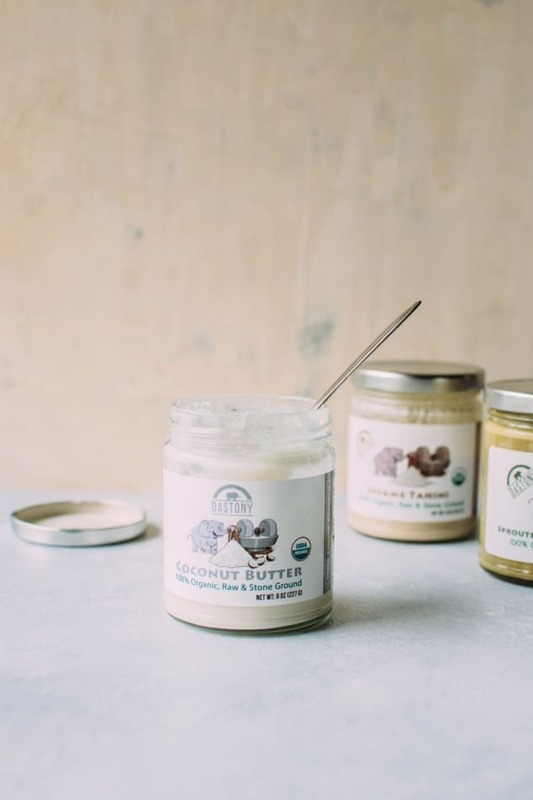 They make everything from out-of-this-world-good coconut butter, to pine nut butter, brazil nut butter, pumpkin seed butter and good old standby’s like almond butter. The quality of their products is apparent in their pure taste, silky texture, and ease of use for so many applications. I was first introduced to their nut butters through Angela at Bare Root Girl, who wrote a nice little article that you can find HERE about making shortcut nut milks. Hint: One of the recipes involves Dastony’s raw nut butters, take less than 5 minutes to make, and will knock your socks off! You should check her article out, because after that, I knew they had a good thing going on. 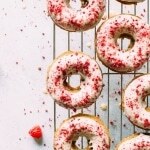 For this grain free raspberry donut recipe I included their coconut butter in the glaze. The thick and luscious texture helped build a beautiful firm glaze that was the literal “icing on the cake” for these sweet treats! Now let’s just be clear before we go any further, these are not what some would call, real donuts. They are baked in a donut pan, not deep fried or yeasted. But they are damn delicious, and a pretty satisfactory substitute for the real thing if dietary restrictions or a desire for a healthy alternative is what has steered you towards this recipe. For the base of the donut recipe I used a variety of flours. Which, I know can be annoying if you don’t already have them on hand, but in order to get just the right texture that I was looking for I found this blend to work the best. And trust me when I tell you they are WORTH IT. 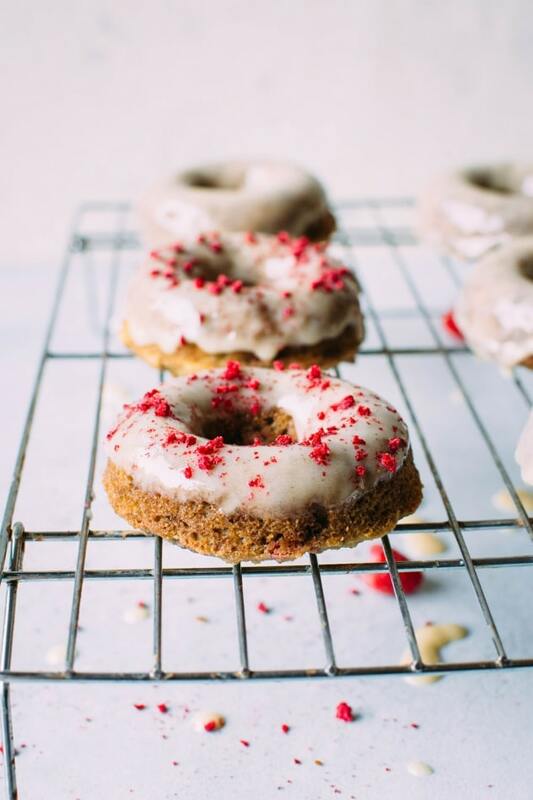 The result is a tender donut that still holds together well, unlike some paleo friendly baked goods that are made with only coconut or almond flour. These flours are great at absorbing moisture and providing crumb, but they’re not so great at holding a baked good together, or giving them that springy texture that gluten does. That’s where the tapioca flour comes in. Not only does it help bind the donuts together, it also gives them a springy, I’m-a-real-baked-good texture. The glaze ended up being the trickiest part of this recipe. I wanted that nice firm result that was reminiscent of the glazed donuts of our childhood. My first try just ended up soaking into the donut. Making them more soft, too sweet, and just not at ALL what my donut focused brain had imagined. I went back to the drawing board and in walks Dastony organics coconut butter to the RESCUE! This stuff is so good you can (and has been.. ahem) eaten right off of the spoon. I paired it with some cacao butter (the fat from cacao beans that is used to make chocolate) for that little extra setting power, vanilla, and maple syrup (for just a kiss of sweetness) and we were in BUSINESS! There is some fridge chilling that needs to happen in there to keep the glaze set, but most paleo // grain free baked goods stay longer in the refrigerator anyways so this was a no brainer. The result (three times tested) stood up to many eager taste testing bellies (thanks guys!). Even the regular eating donut people could get down with them. 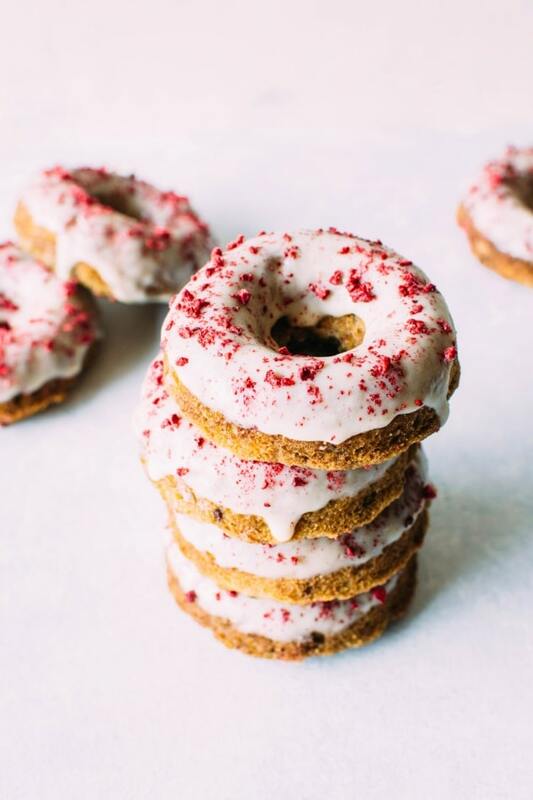 So get your grain-free-donut-loving-self on board and dig into this very sweet and worthy baking project to bring some SERIOUS joy to yourself and others! 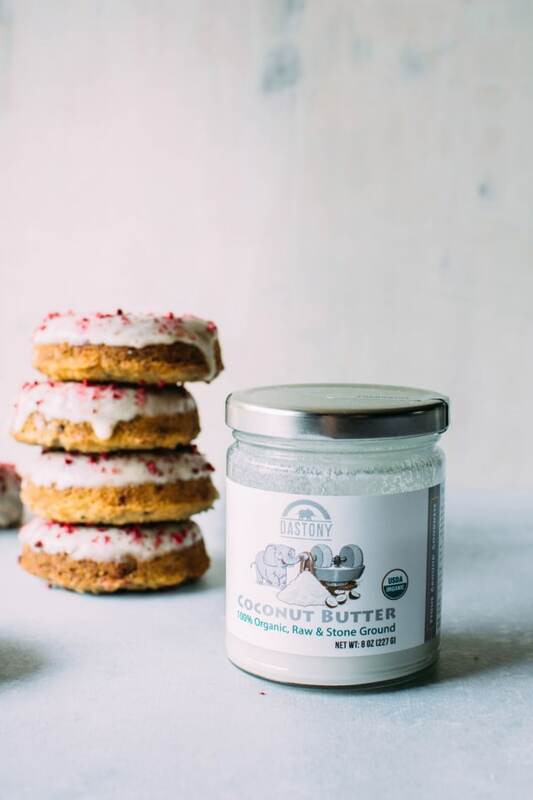 And head on over to insta to grab an entry for the sweet giveaway of one of their coconut butters to get ONE STEP CLOSER to vanilla coconut glazed nirvana! 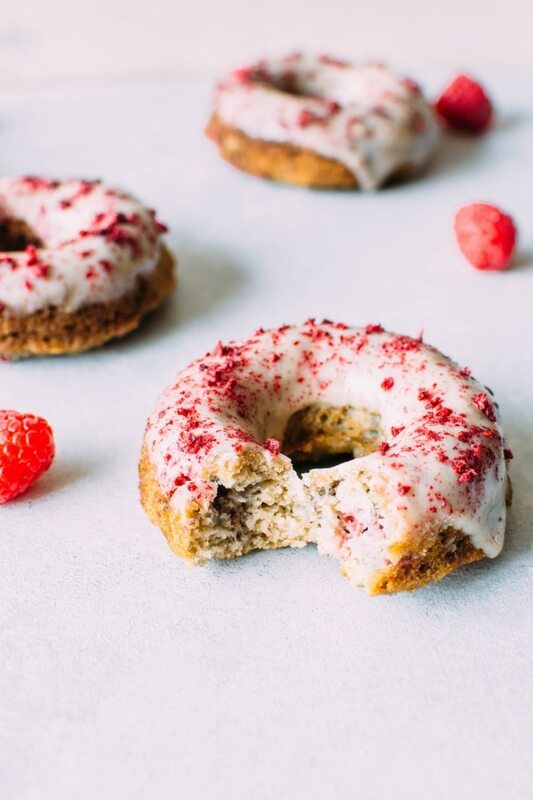 Grain free raspberry donuts with a vanilla coconut glaze! 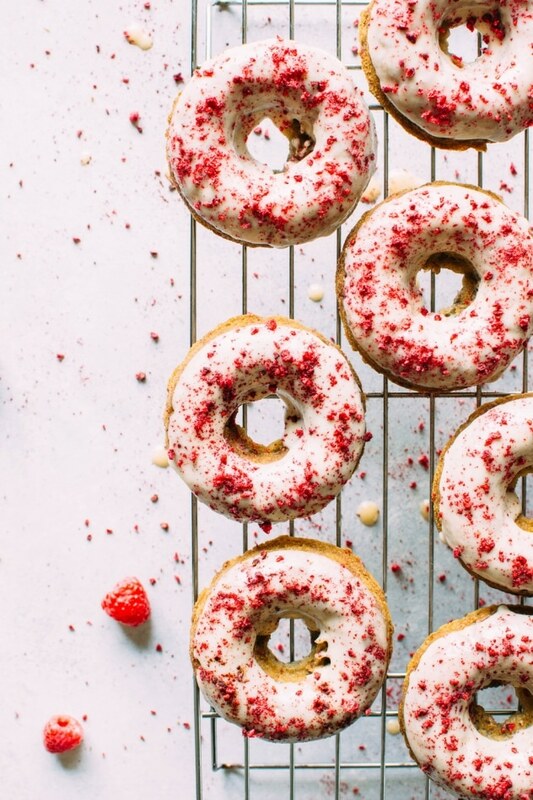 Crumbly in all the right ways, slightly springy in texture, studded with fresh raspberries, dipped in a luscious vanilla coconut glaze and sprinkled with tart dried raspberries. 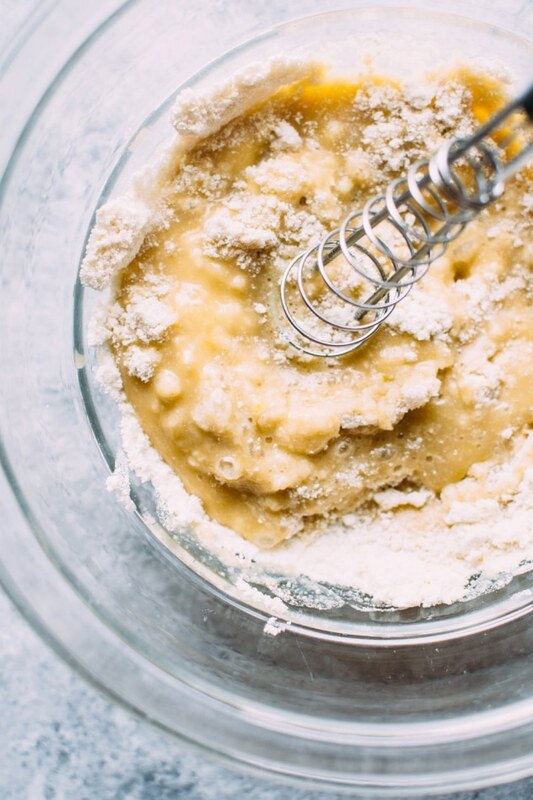 In a large bowl whisk together all of the dry ingredients – almond flour, coconut flour, tapioca flour, sea salt and baking soda. In another large bowl whisk together the wet ingredients – eggs, maple syrup, almond milk, melted ghee and vanilla extract. Mix the wet ingredients into the dry until thoroughly combined. Let sit for about 10 minutes to fully hydrate the flours. In a small bowl, gently smash raspberries with a fork. Fold into donut batter. Generously grease donut pan with ghee or coconut oil using your fingers or a paper towel. Spoon batter into donut pan, filling just barely to the top. Tamp batter down and smooth with your finger or a spoon. Bake for 16-18 minutes, until golden brown on the bottom and center is dry. This recipe makes about 9 donuts, which for my 6 count donut pan meant 2 rounds of baking. When slightly cooled, remove from pan and allow to fully cool before dipping in glaze. Melt cocoa butter first, then measure. In a small saucepan, combine all ingredients, including pre-melted and measured cacao butter. Heat gently and whisk until all ingredients are melted and well combined. Move to refrigerator to cool. Glaze is ready when it’s the consistency of melted chocolate. If it breaks or sets too firmly, you can melt and whisk together again, before chilling once more. Dip donuts in glaze and place on a baking sheet. Move to the refrigerator or freezer (will set faster in the freezer) to set. 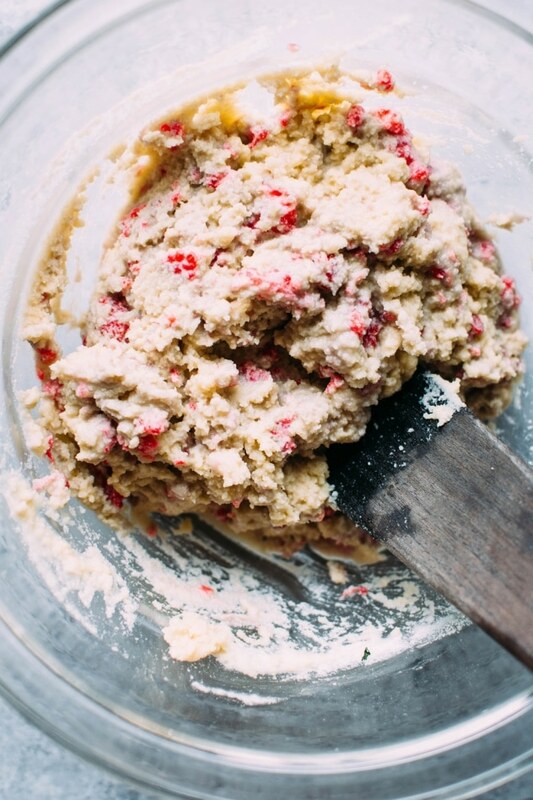 Once set, dip one more time, and sprinkle with crushed freeze dried raspberries. Move back to the refrigerator or freezer to set once more, and serve! Store in the refrigerator, allowing about 5-10 minutes to come to room temperature before serving. During my testing period, the temperatures in Seattle were very HOT. So the chilling between glazes was absolutely necessary to get it to set properly. If you’re in a cooler climate, or making this in fall/winter, it may set without refrigeration. These donuts will keep refrigerated for at least 4 days, if not more. This entry was posted in sweets and tagged almond flour, coconut, coconut flour, donuts, easy, gluten free, grain free, healthy, paleo, raspberries, sweets, tapioca flour, treat, vanilla on September 8, 2017 by Nyssa Tanner.